What is Nutrisystem Fast 5? This is a Sponsored post written by me on behalf of Nutrisystem . All opinions are 100% mine. Are you looking to get healthier after the holidays? Get more information about what is Nutrisystem Fast 5 and why it may help! The new year is just around the corner which means many of us will be clamoring to get healthier, especially after likely gaining a few pounds with all the holiday goodies. If you’re always on the go, though, it can be rather tough to eat healthier, especially if you’re used to pulling into the drive-thru. Though I’m no longer on the program because I have my own kitchen and time to cook now, when I didn’t have that option, Nutrisystem was a lifesaver for me by providing portion-appropriate and nutritious meals that were quick and easy to cook. That’s why I’m happy to help introduce the Nutrisystem® My Way® program with the Nutrisystem Fast 5 as well. Nutrisystem My Way is an all new program which is special as it is tailored to each individual’s metabolism for maximum results. No, Nutrisystem isn’t looking through some sort of crystal ball, but using a science-backed algorithm to estimate each customer’s metabolic rate and have you eat the perfect amount of calories each day. Plus, you’ll have a counselor to help you make changes as you lose weight and your metabolism changes. 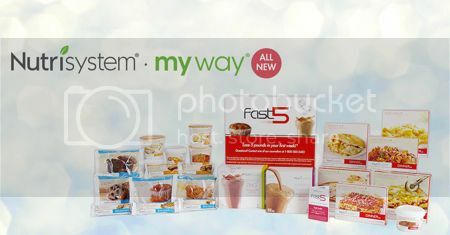 With the Nutrisystem My Way program, you’ll also get the new Nutrisystem Fast 5 for free, which is a one week jump start kit. During this jump start week, you’ll find all the tools to help you accelerate your weight loss during your first week. In fact, you’re promised a 5-pound weight loss backed by a money-back guarantee! In the Fast 5 program you’ll get 7 specially selected breakfasts, lunches and dinners to help boost your beginning weight loss. You’ll also get shakes with special formulas for men and women that feature metabolism boosters like green tea extract and vitamins and antioxidants to keep you healthy. After your first week with the Fast 5, you’ll move onto your 28-day My Way program.